CEO’s Chat - Steve Slater on some happy selection tasks. News - CAA seek feedback on Electronic Conspicuity. Retro fit avionics - Ian Fraser discusses some portable digital instrument upgrades. Netherthorpe - Sheila Dyson presents a history of Sheffield’s LAA friendly airfield. Projects - Zenair 701, Sherwood Scout completions and a Condor refurb. Air Courtage - The importance of insurance cover for airshows and events. Fuel Injection P1 - Part 2 of a Rotax and ULPower injected engines primer. Destination - Martin Ferid extols the virtues of chic Le Touquet on the French coast. 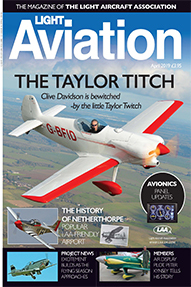 Air Test - The Taylor Titch’s fun factor certainly impressed Clive Davidson. Safety Spot - Chobert rivets, Luscombe corrosion Murphy strut ends. Armstrong-Isaacs - Brian Hope presents the 2019 A-I Bursary winners. Meet the Members - Pete Kynsey, long time display pilot and Tiger Club CFI. Where to Go - GASCo Safety events, plus dates and details of upcoming fly-ins. Classifieds - Surprisingly busy with bargains to whet your appetite. Landing Vouchers - Save money with our fee landing vouchers for May.